MONTREAL — The Montreal Canadiens are hitting their stride when it matters the most. With five games remaining this season, the Canadiens are still holding on to a playoff position following a decisive 6-1 victory over the Florida Panthers on Tuesday night. Montreal has won four of its past five games (4-0-1). "It's huge right now," said Andrew Shaw, who had two assists against Florida. "It just shows we're a character team. We're working hard, we're competing. We're going to earn our own spot in the playoffs and not rely on someone winning or losing." Montreal is in a tight three-team playoff race with the Carolina Hurricanes and the Columbus Blue Jackets. The Canadiens (41-28-8) are in the second wild-card spot, one point behind Carolina and two points ahead of Columbus. Both the Blue Jackets and Hurricanes have a game in hand on the Habs. Montreal's next opponent is Columbus on Thursday. "The last few weeks now, we've known the importance of every game," said defenceman Brett Kulak, who scored the winner. "We've got a little momentum rolling here and it gives you a boost of energy when you can come out and score early and everyone's feeling good like that. "We've really settled into our identities as a team. Everyone knows their role and everyone's playing their role really well. That just builds confidence." 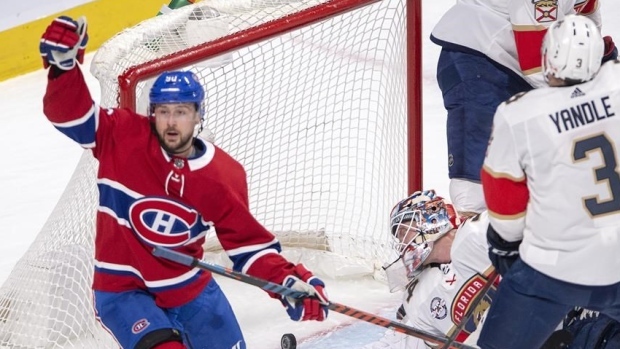 Tomas Tatar and Carey Price led the way against the visiting Panthers on Tuesday. Tatar scored twice and added an assist while Price stopped 33-of-34 shots in his ninth consecutive start. Florida (33-32-12) was officially eliminated from playoff contention. Tatar got the ball rolling at 6:58 of the first period when he beat James Reimer with a shot off the post and in on a feed from Shaw behind the net. The home team went up 2-0 through Kulak's one-timer at 12:39 for the defenceman's fifth goal of the season. Tatar added another for Montreal less than two minutes later when he shovelled a loose puck in the crease past Reimer, who mishandled Shea Weber's initial shot from the point. Reimer, who had not played in exactly one month, was pulled after allowing three goals on nine shots. Sam Montembeault stopped 15-of-18 shots in relief. The Canadiens took a 4-0 lead when Artturi Lehkonen's shot deflected slightly off Aleksander Barkov's stick at 2:52 of the second. Left alone in the crease, Phillip Danault scored Montreal's fifth of the game when he squeezed a puck between Montembeault's pads from the doorstep at 12:40. The Panthers have conceded 20 goals on their current three-game losing skid. "Five of their six goals, we just let them have as much time and as much room as they wanted in front of our net," said Florida's Vincent Trochek. "It's just laziness, not doing your job. It's just unacceptable, leaving our goalies out to dry. To give up that many goals in the last three games is an absolute embarrassment." The only player to beat Price was Frank Vatrano, who scored his 23rd goal of the season at 1:35 of the third period, on the power play. Max Domi made it 6-1 with a wristshot from the face-off dot to the left of Montembeault with 8:12 left in the game. Paul Byron left the game in the first period and did not return after being dropped to the ice in a fight with MacKenzie Weegar. Byron took an uppercut to the jaw before wobbling off the ice with the help of a trainer. The fight was retaliation for Byron hitting and concussing Weegar on Jan. 15. Weegar missed four games with the injury while Byron was suspended three games. "It wasn't my intent to injure him," said Weegar. "I simply asked him if he wanted to own up to the hit. I respect him for that and I hope he's okay. It's a hockey thing. He didn't have to fight me if he didn't want to. I wasn't going to jump him." Notes: Tatar set a new personal record with 57 points in a season. His previous career high was 56 points set in 2014-15 with the Detroit Red Wings.